Residents will enjoy the community’s walkability to the many shopping, dining and entertainment options available at downtown Kennesaw. Fortress Builders is excited to announce Terraces at Depot Park, a new project in downtown Kennesaw featuring 38 townhomes from the $290,000s. Located walking distance from downtown, the builder sold back a portion of the land to the City of Kennesaw to create a more welcoming entry to visitors and residents of the area. 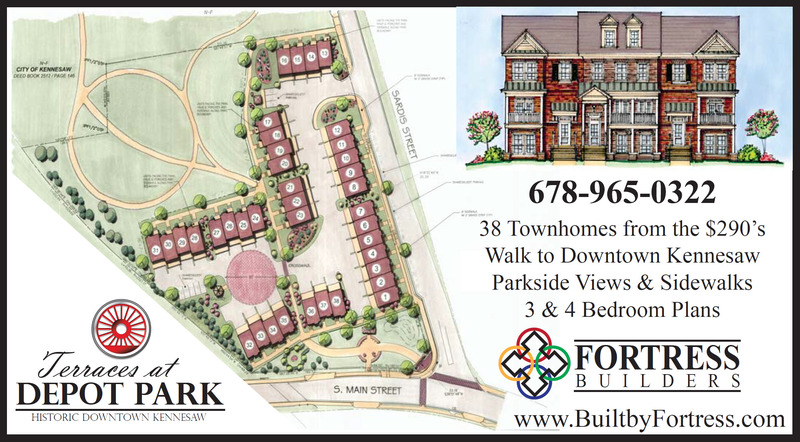 Nestled on the corner of S. Main Street and Sardis Street, Kennesaw’s newest townhome community will not only feature convenience, but also the quality construction Fortress Builders is known for. To further the growth of downtown Kennesaw, the builder’s plans include a pocket park with marquee sign at the community’s cornerstone to welcome the patrons of Kennesaw. Land was also allocated in the sale to serve as a “Depot Park” expansion. Townhomes at Terraces at Depot Park will feature three- to four-bedroom home designs boasting parkside views and manicured sidewalks throughout. Residents will enjoy the community’s walkability to the many shopping, dining and entertainment options available at downtown Kennesaw, in addition to easy convenience to Kennesaw State University, Town Center Mall and Kennesaw Mountain National Battlefield Park. Access to I-75 and I-575 is also nearby. Call 678-965-0322 to join the VIP Interest List and be first to know details for Terraces at Depot Park including plans, incentives, grand opening events and more. To learn more about opportunities from Fortress Builders in the metro Atlanta area, visit http://www.BuiltByFortress.com. Locally owned, Fortress Builders has more than 50 years of combined experience in constructing attractive homes and communities. Fortress Builders does more than just build new homes. The builder also creates a distinctive sense of community and does so in two of Atlanta’s most sought-after locations, Cobb and Cherokee counties. Over the years, the Fortress team has accumulated a vast archive of attractive new home designs with an emphasis on tasteful architecture and cozy, livable interiors. Feature by feature, Fortress offers its homeowners the most complete package of attractive elevations, quality construction, financial affordability and an industry-standard warranty to back it up. A Fortress-built home is built to last. For more information, visit http://www.BuiltByFortress.com.